July 16, 2007: Accelerating from 0 to 60 then slowing down for a stop light is no problem for an ordinary automobile. But if you were piloting a rocketship, it wouldn't be so easy. Most rocket engines are designed to burn full-on (liftoff!) or full-off (coasting through space) with no in-between. And that can be a problem--namely, how do you land this thing? Throttling is crucial for a planetary lander. Descending from orbit is a unique balancing act, cutting engine power as the lander losses mass through the engine exhaust that slows it, until landing pads just kiss the surface. For a lunar landing, velocity drops from almost 4,000 mph to 0 in about one hour. 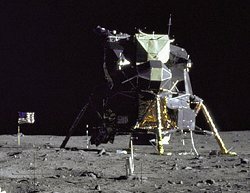 Right: Apollo 11's Lunar Module, the Eagle. The Apollo Lunar Module (LM) descent engine, the all-time throttling champ, did it perfectly on six landings in 1969-72. It could throttle from 10,125 lbs down to 1,250 lbs. It was also a simple engine, burning corrosive fuel and oxidizer that ignited on contact, and fed by pressurized tanks, eliminating the need for pumps. NASA is heading back to the Moon in the next decade, and "we want to put more mass down on the lunar surface than Apollo did. That means we need a higher-performing engine," says engineer Tony Kim of NASA's Marshall Space Flight Center. "The Apollo Lunar Module descent engine was very good, very reliable, but it doesn't have the performance we need for future exploration." To investigate technologies for a next-generation lunar lander, engineers at two NASA centers--the Marshall Space Flight Center in Alabama and the Glenn Research Center in Ohio--are supporting Pratt & Whitney Rocketdyne in developing the Common Extensible Cryogenic Engine--"CECE" for short. At CECE's core is the RL10 engine that boosted seven Surveyor robot landers to the Moon in 1966-68, then flew dozens of other missions for more than 2.2 million seconds of operations (almost 26 days) and 718 in-space firings. The RL10 is a far more powerful and complex beast than the Apollo LM engine. It burns hydrogen and oxygen that are stored as supercold liquids in insulated tanks. These are not only high-energy propellants, but also environmentally friendly compared to the corrosive fuel of the original LM. Now the engine is being asked to demonstrate something new: throttle from 100 percent of its 13,800-lb thrust to 10 percent on command for a human-rated spacecraft. But making it throttle is not as simple as pushing the gas pedal in and out. Like most rocket engines, the RL10 was designed for full power. Almost like a living organism, changes in one area are felt through the entire body. For example, at low power, liquid hydrogen can slow and vaporize in the coolant lines, possibly stalling the engine. 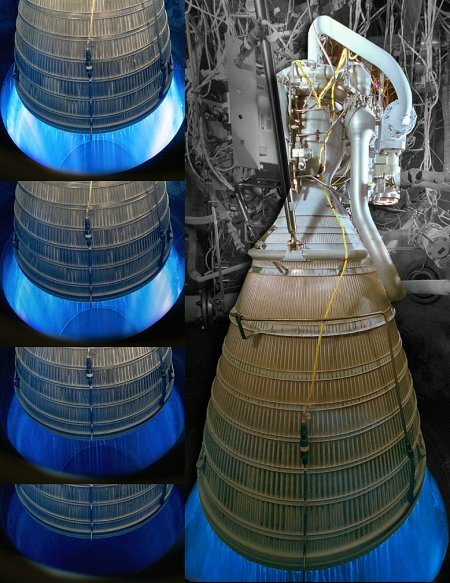 Above: Multiple images on the left are pictures of the CECE engine at different throttle levels. In Phase 1 Demo 1 tests, "we were able to get the engine modified and show that throttling is possible, though cautiously," Kim says. CECE racked up 932 seconds of firing time in eight tests, though some were cut short "because we are experimenting." The principal challenge was "chugging." Something was causing the engine to vibrate 100 times per second. Pratt & Whitney Rocketdyne conducted a "Demo 1.5" to investigate and isolate the problem: It turns out oxygen vapors were forming on the injector plate and inhibiting normal flow at lower throttle levels. "We're considering modifications to the injector and valves to improve performance," Kim says. Already, CECE has demonstrated stable combustion (no chugging) down to 5-to-1 and operability (some chugging) at 11-to-1 throttle ratios. CECE's not ready for space, Kim emphasizes, but it is an important testbed to develop technology. "This work has the potential to influence design of the next lunar lander." CECE is one of a number of candidate technologies being investigated under NASA's Exploration Technology Development Program. NASA's current throttling champ is the Space Shuttle Main Engine, with a range of 65 to 109 percent of normal power. An RL10A-5 used on the DC-X demonstrator in 1993 can throttle 3:1, but that was not a space engine.